Almost all of us fell out of GPK collecting and came back to it down the line. What forced you out back then? What brought you back? Being from the UK we only had series 1 & 2 as you U.S guys know it, then 3 through 6 were a bit of a mish mash. The check lists were all over the shop & the Garbage Gang 91 aka the U.S series 10 was virtually impossible to get hold of so i had no choice but to stop collecting around 1990. Then a mate of mine sent me an email attachment sometime in 1999 saying didnt you used to have these all over your walls, lunch box, cupboards & everything else as a kid. The attachment was Peeled Paul from the U.S series 9!! I just about crapped my pants in shock. I'd never seen this GPK before & i thought i had the lot. I hit the net, found Ebay & havent stopped since!!! I love the little buggers!! I fell in love with the NES when my Mom finally got around to getting us one. It took lots of begging and pleading to get it. I loved everything about the NES. All I ever wanted to do was play. The Legend of Zelda and Metal Gear were two games that actually made me want to design my own games. I remember sitting down and actually drawing them out. Then about a year and a half before ANS1 came out I got back into the game. For some reason I was just sitting in my office at work and they popped into my head. I immediately stopped what I was doing and went to ebay. From then on I've been a die hard GPK fanatic. It reminds me of a similar story posted by Diaz about trading his toys and getting them back in a different state. 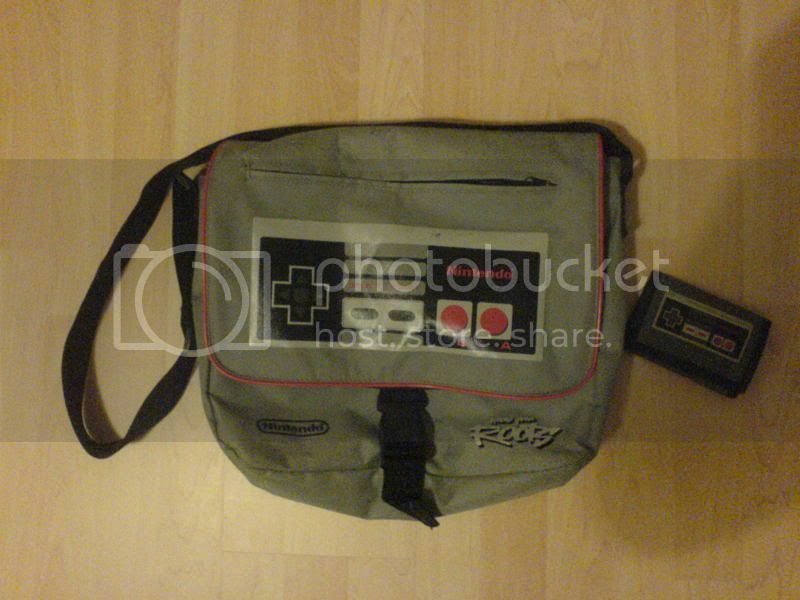 My best friend at the time had the NES and had had it for a few years... I was very jealous of his Castlevania and Zelda games. Both my brother and I had paper-routes in districts right next to each other so before and afterwards we'd always meet up at this local convenient store and buy candy while we were delivering (we would get in trouble for 'wasting' our money and it was closely watched over by our step-monster "mom")... so one day, we were in the store with this other paper-route kid who was an @$$hole... I was in line behind him at the counter and as he was heading out I saw him drop paper money and it looked like a $20.00... so I concentrated really hard so no one would come in the door, or exit before I could get the heck over there to grab it... well... it wasn't just one $20.00... it was freakin' 5 of those bad boys! And the kid was coming back into the store... and I could have easily gave it back to him... but all I had pictured in my head was a brand new NES. I could never afford this on my own, and like any good Christian, I took this as a sign from God... but I had to devise a plan. I couldn't just 'buy' a NES, my Dad and stepmom would go bonkers. So I told my best friend Stuart to hold onto all of my G.I.Joe figures and say his Grandma had gotten him an extra NES for XMas and he didn't need it so we were going to 'trade' for it... I know... not the smartest story in hindsite, but I was desperate. We had previously sold off all of our Transformers and LEGO's at a toy store yard sale stand for money for GPK... if I only had that sh!t for eBay now... damn. So, the 'trade' went smoothly, and the family let me hook up the Nintendo. Little did I know that my Dad would stay up after I went to bed and would play it. LOL. At any rate, a year later when I asked for my G.I.Joes back when I moved back to my Mom's... he conveniently forgot about the 'trade' and my G.I.Joes had sodder holes in them... he had bounced a basketball on my Hyrdrofoil and Hovercraft for bomb-affect... and my Sea Base was missing tons of pieces. It was a bunch of junk. He fugged me over man. i never got out of them, they simply stopped making them. I don't get this thread. and NES didn't stop anything. You can't play nintendo games at school or on the bus now can you. This is a stunning man purse, Shaun! I simply forgot about GPK once I got into the NES. I'd take the game instruction manuals with me to school and read them. Nintendo Power finished GPK off for good. That magazine was great. I had the fuggs memorized by the next issue. A lot of people forgot about GPK and came back to it. ...but GPK's were always in the back of my mind...Rediscovering my Cheap Toys in 1995 (during the peak of my rave years) really got me back into 'em...the UG did the rest! yea, i did all that stuff, too. But you can't say that FOR SURE if GPK's would NEVER have stopped. but yea, i took the manuals to school, too. Especially the Crystalis manual. It was the same situation as Spree & Vero...They simply stop make them! It wasn't until I started going online and rediscovered my childhood. 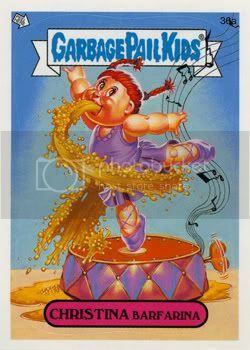 It was websites like Wayne's Garbage Pail Kids Reference , Barren Aaron's Garbage Pail Kids Refernece Guide and Matt's Garbage Pail Kids Archive which help relaunch my GPK addiction again. The last series I collected was OS9. I remember seeing OS10 in stores but never bought any because I was always saving up for NES stuff. Do you guys remember the Nintendo Cereal System. I loved that s**t.
I stopped collecting at OS10 as well. For the life of me I can't remember why...but I know for a fact that I never purchased any OS10 packs in stores. I'm not exactly sure. I spent a lot of time with my cousin when I was a kid at my grandma's house or mine. It was probably riding bikes, playing toys, watching movies, and NES. I liked the game where you shoot the ducks with a gun. I love card collecting in general and remembered about GPK in 2004 when I saw a pack of ANS1 at the store. 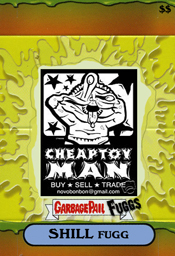 I looked them up on Ebay then found sites like Wayne's and GPK Central and the rest is history. I can't believe i missed this thread. This is a good topic. Personally, as a child i never really got "into" GPK. I liked them and they inspired me as a child, but i really didn't collect them or give them much thought. As an adult, however, my obsession with GPK has floated up and down over the course of almost 4 years of collecting. At the peek of my obsession my only goal was to get a concept accepted by TOPPS. So i spent the better part of 2 years creating characters, studying fundamental art concepts and practicing in any spare chance i got. I ended up submitting some 20 concepts that i considered my best. After that i felt i had reached a short term goal in my life so the drive kinda subsided. Bills started to pick up and for about 3 months i had all but vanished from the GPK scene. It was the a few months before ANS6 that i started picking up my interest again. At this point in my GPK collecting career i feel i've reached a place where i can balance GPK and other aspects of my life, without overdoing it with GPK collecting. 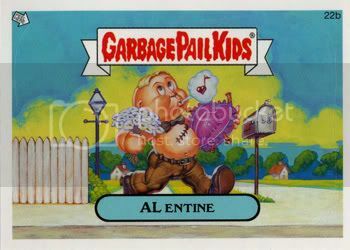 My TRUE FAN love for GPK has never dwindled and never will. I will be 80 years old and talking to my great great grand kids about GPK and this website... and everything the people of this website have shared with me over these past few years. so did they ever use any of your ideas sniglet? Well, thats up for debate. There were 2 GPK that came out in ANS5 that closely resembled my GPK that i had submitted to TOPPS. Now, as i believe Pingitore said, it is not impossible for more than on person to come up with the same concept. So it very well could've been a coincidence. 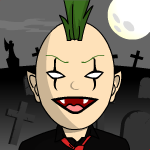 It was actually Cory that pointed out one of them resembled my charcter. Thanks bro. I believe it was Stinger who asked me to do a Exorcist parody almost 3 years ago now. I got into NES around that time too but I'd say what got me out of GPK was that I transitioned into baseball cards. Around '88 I was 11, GPK was "kids' stuff" compared to baseball cards. It also helped that the Oakland A's ruled MLB during those years, fueling my card collecting. ONCE THE DESIGN CHANGED IN OS 10, I LOST INTEREST. ALSO, LIKE MANY OTHERS HAVE STATED NES CAME ALONG AND I BECAME MORE ACTIVE IN SPORTS. I stopped collecting them because I couldn't find stores that were selling them anymore or other kids to trade with. I wasn't able to finish my 14th series set and didn't even know there was a 15th at the time. I got back into GPK when the All New Series came out in 2003, but gave up a few years later because I didn't really care much for the new ones. Earlier this week a saw the GPK Flashbacks at a store, bought a pack, and now I'm back (for the time being). It was also the 10th series for me. My mom bought me a pack, and I said I don't want any more. They just were not the same. 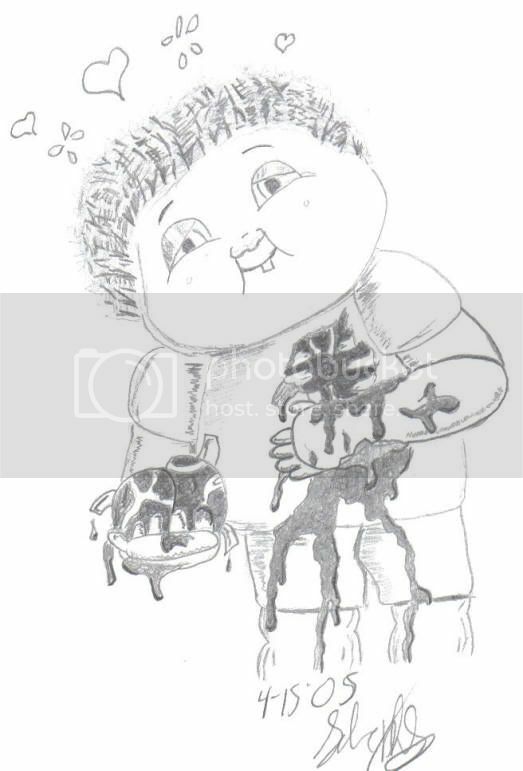 As I child I had collected lots of things besides GPK's. Muscles, coins, baseball cards and video games. When I saw the ANS2 at a store with the foil cards, I had to collect them again. Then I went to ebay so I could live my childhood once more. The only thing that forced me out was the lack of them making more sets after 15th and not knowing about foreign cards until the internet and ebay back in 98. Even before 98 I still tried to contact a few stores to find GPK. The only big sources back then were Roxanne T and Mark M, and maybe a couple others. I don't think i ever got out of it as such, as never chose to finish collecting, more the shops stopped selling so unable to continue. As living in the uk the sets also got very mixed up. Like most on here it lay dormant until such a day you would browse the internet and ping you realise you can find out about anything. You then start typing all the dormant things in your head to see whats out there on them it was great to relive so many memories. Then you slowly start to buy some old memories back, i bought a lot of old tv series that i enjoyed as a kid only to think why on earth did i enjoy watching this, but it was good all the same. One i found very difficult to track down was the Fall Guy (lee majors) but that is now starting to become readily available. The trouble i find nowadays is that there are lots of cards i would like, but adult commitments does not always permit you to be as free with your money. With a family you also have to be careful where you put the cards as they are a magnet for children. The greatest thing with it all is that it is something i can share an interest with my kids and pass on the baton and collection at some point. Heres to our generation and igniting the next. My GPKs I had in the 80's were either sold at a yard sale or given to charity. But I was never like: "I don't like/want them anymore". As an only child I had tons of toys. Every B-day and x-mas, me and my mom would go through my stuff and select things to give to less fortunate kids. It really felt good knowing that I was helping other kids. We often donated toys to the "toy run' that the bikers do every year. My Rainbow Brite doll even got in the news paper (she was tied to the front of one of the bikes in the toy run). As a teen I started to realize just how cool GPKs really were. And eventually, ANS 1 was released. I have been a dedicated collector ever since.